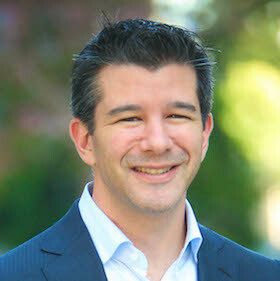 Co-Founder and CEO, Uber Technologies, Inc. Whether it’s founding the world’s first P2P search engine, or developing the premier enterprise content delivery system, Travis believes that every problem has a solution. You just have to be creative enough to find it. That spirit is at the very core of Uber’s success and ever-expanding global presence, currently in over 210 cities in 45 countries on six continents. As a student at UCLA, Travis founded Scour, the first peer-to-peer search engine. He later expanded on the concept, forming Red Swoosh, an enterprise content delivery platform, which was eventually acquired by Akamai Technologies. While visiting Paris for LeWeb in 2008, Travis and friend Garrett Camp dreamed of pressing a button on their smartphones one minute, and riding away in a reliable and stylish ride the next. Uber launched a year and a half later, in June 2010 in San Francisco. Under Travis’ leadership, Uber has grown from an exclusive San Francisco-based service to an application used by millions of riders and hundreds of thousands of drivers in over 200 cities worldwide. Uber has transformed the fabric of those cities, increasing affordable and reliable transportation options, delivering unmatched earning potential to drivers, reducing drunk driving rates and powering local economic activity. Where some people see dead-ends, Travis finds detours and new solutions to old problems. That approach is revolutionizing the way people move, work and live in cities around the world.